Maximum Engraving: 4 Lines with up to 15 characters per line. Our hexagon shape plastic key tags are perfect for permanent identification of keys, valves, cases and more. These tags are 1/16" (.060) Thick, 2 Ply outdoor rated , UV Stable engravers plastic for long life. Lettering is engraved by removing the surface color and exposing the core color beneath. 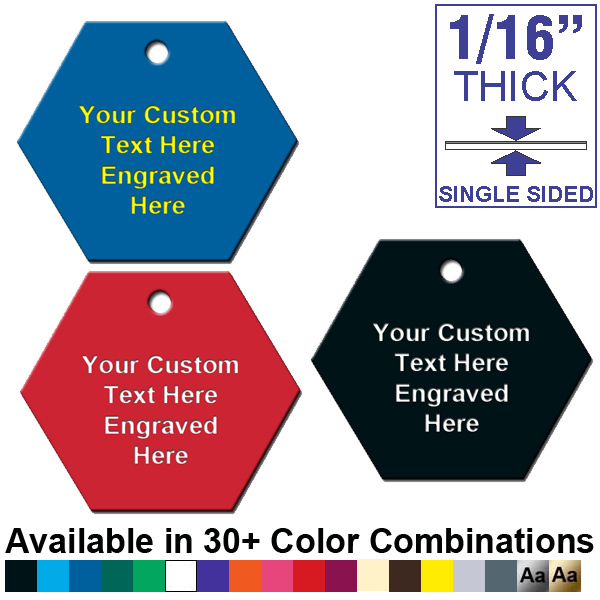 Custom engraved hexagon shape key tags are 1 1/2" x 1 1/2" in size and .060" thick. The keyring hole is .180" in diameter. Maximum 4 Lines. You can fit about 15 characters to a line. The more letters you use, the smaller the text must be. Max. 15 Characters per line..